I know I just complained to you in a recent post on Thai spicy basil stir-fry about the scarcity of holy basil (Bai Ka-prao ใบกะเพรา) outside Asia (which has led to all the faux Pad Ka-Praos on the menus of several Thai restaurants in Europe and North America). But may I please have your permission to whine a little more? It’s so hard to find lemon basil. And nothing can be used in its place. Nothing. To make matters worse, lemon basil has ridiculously short shelf life. By the time, you discover that some fresh lemon basil has made a rare appearance at your favorite Asian store, it’s already half dead. So it’s unfortunate that lemon basil (Bai Maeng-lak ใบแมงลัก) happens to be an indispensable garnish/accompanying herb for rice noodles with curried coconut-fish sauce (Khanom Jin Nam-ya ขนมจีนน้ำยา) and an ingredient in spicy mixed vegetable soup (Kaeng Liang แกงเลียง). 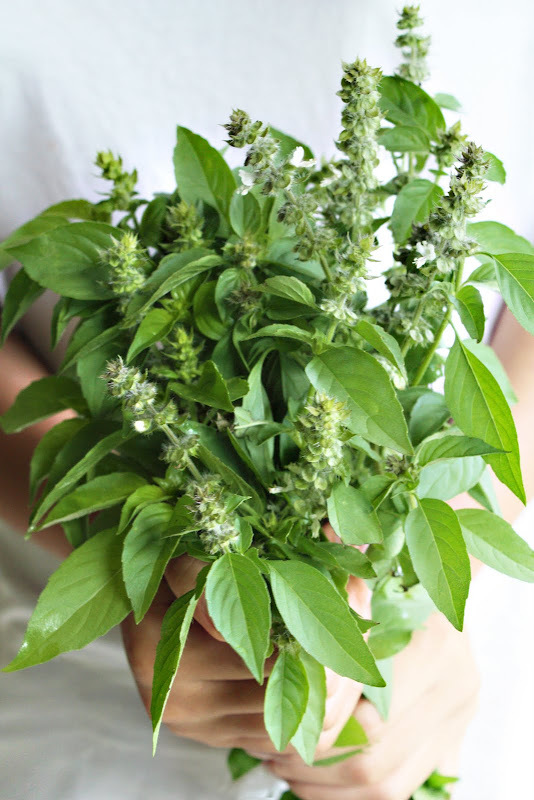 And while holy basil and sweet basil can be interchangeably used in some cases (it is not ideal, but it doesn’t precipitate the end of the world either) no other kinds of basil can be used in lieu of the unique, citrusy lemon basil. The two aforementioned dishes, for example, become sad and depressing — the latter especially — in the absence of this herb. Fortunately, just as you can grow your own cilantro in order to harvest the roots, you can also grow your own lemon basil. Lemon basil can be grown from seed easily, grows fast, and is low-maintenance; the seeds can also be found easily in the US. It can also be grown indoors provided that you give it enough sunlight daily. The easiest way to plant lemon basil that I know of is to fill a wide pot (with drainage holes) with top soil about 3/4 of the way. Then scatter the seeds on the surface of the soil (leaving about 4-5 inches between them) and moisten the soil lightly. The seeds should sprout in 7-10 days. With some sunlight and adequate water, your lemon basil should be ready for harvest around 30 days after the seeds have sprouted. The plants should produce new leaves for you to harvest every week thereafter. Some fertilizer once a month should be adequate (highly recommended especially if you grow lemon basil indoors). Unfortunately, it’s also not that readily available in Thailand – at least here in Ayutthaya. Neither Big C nor Tesco-Lotus stocks it. I have a TON of lemon basil, and apart from using it in chimichurri (in lieu of the lemon zest/juice), I’m at a loss as to what to do with it! Any recipes for the above, or any other ideas? I see that you have so much lemon basil. can you please tell me where I could source seeds to grow it. I live in Victoria Australia. Also if you can help me with how to grow it in a cold place like Melbourne. apostcard – Seriously!? Oh, my. sundevilpeg – Great idea! I’ve always wondered about the different ways people around the world use lemon basil. We’re about to doing some major overhaul in our garden. I will save a spot to try lemon basil. Thanks for sharing and I look forward to trying that noodle dish. Yum! I guess you just need to move to Hawaii! Everyone I know is growing Tulsi and lemon basil! How different or similar is Lemon Basil to Lime Basil, which volunteers in my garden every summer and grows like a weed? I’m hoping that you say they’re similar. :)I’ve never seen lemon basil for sale (as a plant). Laura – Hmm. I have never tried lime basil, so I don’t know. It’s REALLY lime-y if that helps. 🙂 More lime flavored than basil, although the basil is there too. Laura – I’m curious. Need to grow it to find out. thank you for sharing your knowledge of all Thai food items. Please enter my name for the drawing of the Modern Baker book. I just found this site today. I LOVE thai food and have been trying to cook it on my own for years, getting hints here and there from a thai friend or two. I would love to here more about the history of the people and land. your writing does not bore me at all! I have rather enjoyed it. keep writing Please!! It is facanating. I am from Indonesia and we use lemon basil in some dishes or just eat rat it raw (like salad) with sambal oelek (homemade, of course). In Java, we usualy use lemon basil for Pepes or steam mashed tofu/mushroom/chicken/fish wrapped in banana leaves. My mom put lemon basil in our ramen; it’s delicious and refreshing. 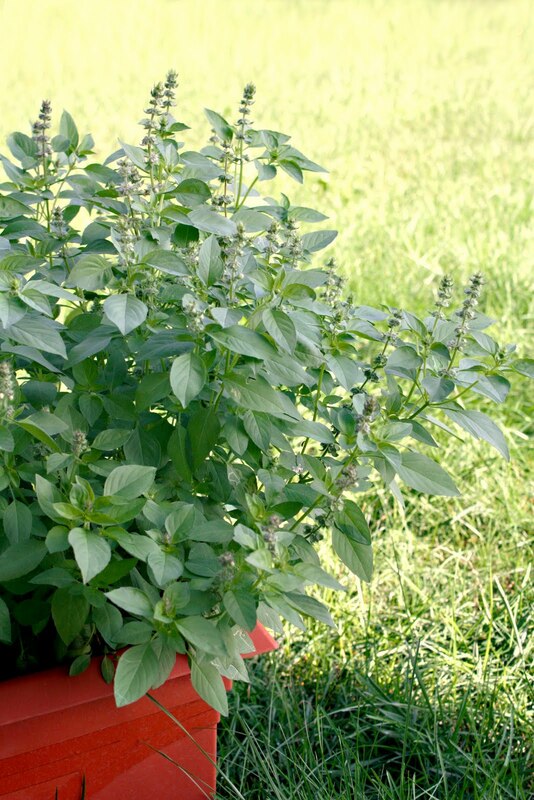 One of the benefit of consuming lemon basil is it removes body odor.